getCodeBase() method of Applet class. This method gives us the location of the directory in which our applet code file is located. This location is returned to us in terms of an object of URL class. Using this object of URL class, we can get and load any image file present in the same directory using the next two methods. getImage() method of Applet class. This method gets the image file in the form of Image object. This image file named name is present in the directory location specified by url. This directory also contains the applet code. drawImage() method of Image class. This method draws the image referred by Image object img, at the coordinates x and y in an applet's window. We also need to pass an object of ImageObserver interface. 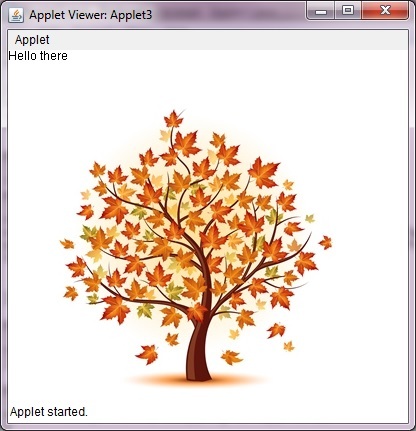 We can do by passing this reference of our Applet class, because it implements ImageObserver interface. Loading an image in an applet. In the upcoming code, we are going to use all the three methods discussed above to read and load an image from a specified location. Where Applet3.java is the name of java file that contains the code of an applet. In the code, as we are calling System.out.println() method, hence we are going to receive some output at the command promt on the execution of this applet. 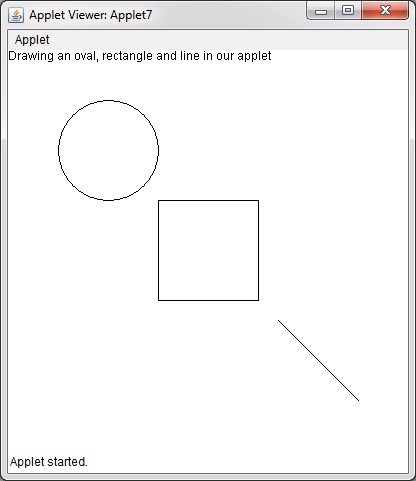 Drawing shapes in an applet. In the next code, we are going to draw geometrical shapes in an applet, such as an Oval, Rectangle and a line, by calling appropriate methods of Graphics class. Where Applet7.java is the name of java file that contains the code of an applet. Our applet window with the geometrical shapes drawn in it.